Week 14 is here. We start with the Titans vs. the Jaguars tonight at 8:20 Eastern time, and on Sunday, Aaron Rodgers and the struggling Packers will take the field against the Falcons. 🙌 Mike Edelstein is at the top of our Week 13 leaderboard with 137.0 points. 🏆 Greg Chili Van Hollebeke is still in first place on our overall leaderboard with 1,002.1 points. 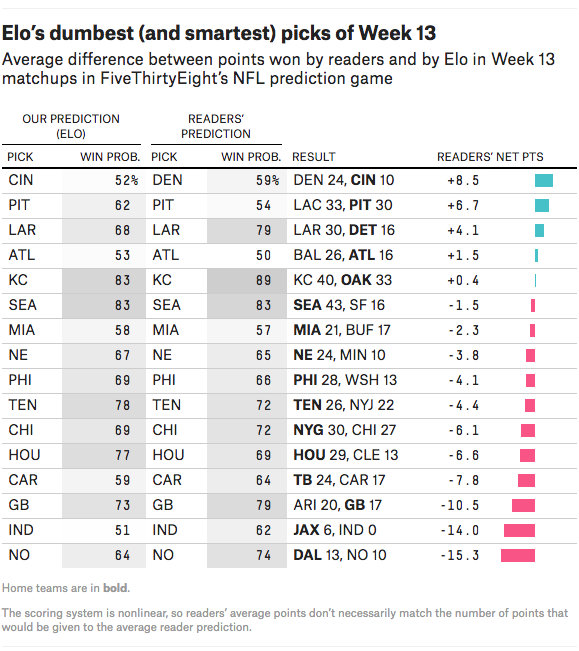 FiveThirtyEight’s Elo model is in 635th place with 576.4 points.